After investing $565 into the history-making event, he/she will walk away just days later with a 1,130 times return on his/her investment, turning the smallest buy-in offered at the WSOP in 35 years, into a $638,880 first-place prize – and of course the most coveted trophy in poker, a WSOP gold bracelet. The total prize pool for this event is $11,187,000, with the winner’s share worth $638,880. A record 2,241 will receive cash prizes for their participation, with the minimum prize set at $1,096 for 2241st place. 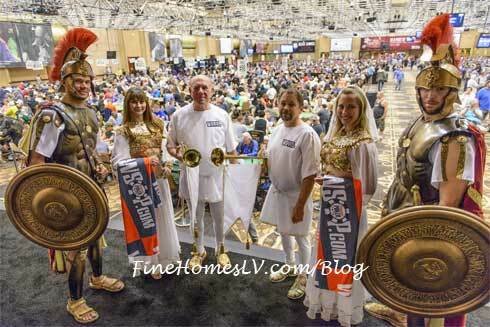 Officially, WSOP Event #5 – the opening weekend event at this year’s WSOP – saw an incredible 22,374 official entrants participate, the most ever to play in one tournament in the history of live poker. The most players previously to enter any one poker tournament was at the 2006 WSOP, when the Main Event that year attracted 8,773 players. While Las Vegas is used to holding mega events, like the recently completed Mayweather-Pacquiao bout that drew a sold out crowd of 16,800 earlier this month, it will be the WSOP’s Colossus that stands tallest. This WSOP event compares quite favorably to the NBA off a record-breaking season of attendance averaging 17,826, while the NHL, off a strong year too with a 17,443 average. BEST SINGLE-DAY ATTENDANCE EVER: Saturday, May 30 – 12,172 entries (May 29 becomes 2nd-largest all-time with 10,202) (Break last-year’s record set opening weekend for Event#8 Millionaire Maker 7,977 entries). And here are some of the unique statistics from the event. (A much deeper dive should be done in 48 hours, hopefully in time for final table play). But the 2015 WSOP isn’t done. In fact it is just getting started. After opening May 27, the 46th iteration of poker’s longest-running and richest annual gaming event continues through July 14 at the Rio-All Suite Hotel & Casino in Las Vegas, Nevada. A slew of athletes and entertainers have participated in WSOP events this summer already, including actor James Woods (reached the final table of Event #4), television host Mark Wahlberg, Super Bowl champion Richard Seymour, former MLB star Jose Canseco and international soccer player John Arne Riise. Many more are expected to join the thousands of recreational players, amateurs, hobbyists, bucket-listers and professionals who all make up the modern-day World Series of Poker.